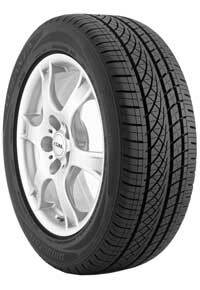 My factory tires - Firestone Firehawk GT - were good in dry weather but bad for rain and snow. I had just moved here from PA where winters are bad so I talked to my dealer about the traveling we do back and forth to PA and I was recommended Bridgestone. I had them on for couple months and got a good test mix of winter and dry conditions. I love them and would buy again. These are great tires. I was considering some Michelin tires but received a recommendation for the Bridgesone Serenity Plus. I'm very glad I followed this advise. The original equipment tires were Michelin Mxv which only lasted 40k miles. I got a set of Uniroyal's next, which also only lasted 40k. But the Bridgestone's are the best by far and ride better than any other tire on this car. I would highly recommend these tires. Great tires. Especially for the price. Will recommend or buy again. I bought my Genesis used with 23k miles on it. It had the original Dunlop tires and they were noisy and had terrible traction in snow. So I put on Pirelli P Zero Nero and they were not much better, only lasted 22k miles. So I decided to bite the bullet and spend money for an expensive tire that hopefully would perform and last long; I put on Bridgestone Turanza Serenity Plus, holy cow what a difference. The car rides extremely quiet, it has great traction, and best of all, I have 53k miles on the tires with about 15k left to go, they are not even close to the wear bars. I rotate them at every oil change (about 5k miles). These tires were made for this car. They probably will do great on other cars too. I plan to get these tires again when needed. Great tires! The tread design aids in a smoother and quieter ride most definitely. The extra wear you can get out of these tires is worth the extra cost. Just bought the vehicle. Not sure about snow traction yet, but based upon reputation of staff, I have confidence in quality. I love these tires. This will be my 2nd summer coming up that I've had them, and as soon as I put them on my car, I can feel the difference in the drive and grip from my winter ones and I love them. A little more pricey but well worth the money. I highly recommend these tires to anybody who is looking for a good performance tire that gives you your moneys worth and peace of mind for safety. Put these tires on a 2012 Corolla due to heavy snow fall in the Midwest region. They preformed excellent in the snow and in the wet. With this tire you will have to worry about a tune up before a tire change or sell the car twice before buying new tires. Great tire and performance for the price. Have had these tires for a year now and have nothing but good things to say about these tires. They provide a smooth, quite ride while giving me the traction I need in all weather conditions. I would definitely purchase these tires again and I recommend them to everyone I talk to that are looking for good tires!!! They wore out too quickly. Didn't perform well in snow. Have had these tires for a little over a year now and have nothing but good things to say about these tires. They provide a smooth, quite ride while giving me the traction I need in all weather conditions. I would definitely purchase these tires again and recommend them to anyone. I like the tire so far and have had very good luck with Bridgestone's in the past. (Got 80,000 miles on one set.) I'm waiting to see what kind of mileage I get before passing final judgement. Great tire. As compared to OEM tire, lower noise and better comfort, stability. I did some research and decided to go with serenity's. It was like getting a brand new car. It feels like i'm driving a Lexus, and what's nice about these tires is that I got more than 2 miles per gallon and unbelievable performance in low and high speeds. Fast reaction and excellent grip. Can't believe the improvement these tires made. My old Michelin's were getting really noisy and every bump was felt and heard. The Serenity Plus are so smooth and quiet, I feel like I'm in a new car. Handling is only slightly less responsive than the hard stock tires, but the comfort is supremely better. Road noise is also reduced. Recommended, but I have little experience with comparative tires. I usually only run the stock tires and never have had such a nice tire before. Knew these were everything I hoped for before I got off the tire center parking lot and to the first traffic light down the main street. Had run Fuzion tires 47,000 mi in 3 yrs so everything the ratings said about these Serenity Plus tires was immediately evident---QUIET, SOFT, SMOOTH RUNNING, LOW RESISTANCE, allowing me to let off the gas way sooner than before when approaching any reason to decelerate or stop. Both my wife and I wear double hearing aids, so the lack of background tire noise has been a real blessing to us. The 1300 miles of this first month included 400 miles interstate CO to KS and back again. Have nothing but praise for the tires and, again, the reliability and accuracy of the evaluations. Have only driven these new tires in dry and light to moderate rain conditions, thus the N/A ratings on hydroplaning and snow. Did find that on county gravel roads in KS I had to drive 5-10 mph slower than before, as the extra-deep (and softer?) tread really grabbed the crushed limestone and threw it up under the car. Son-in-law in his Suburban following me asked what happened that I cut back our usual speed and maintained the lower speed on the gravel portion. Gravel a very small portion of our driving, so still say these tires are the best, at 75K warranty and UTQG rating of 600. I have tried most Bridgestone Turanza's LS-H then Serenity ( my favorite) and now the Serenity PLus.The old Serenity were excellent wet tires, the new Serenity has slightly narrower grooves but more slits cut into the thread ( likely to aid in winter).Otherwide the tires are very quiet slighlty more than the old Serenity. The old Serenity lasted a very long time.I have never gotten more than 20-25k miles out of any tire before the old serenity, and this is my wifes daly driver (26 miles daily on straight roads). Although I have only had these tires for about 200 miles, virtually all areas of performance are outstanding and live up to what the salesperson stated. I have cloverleaf freeway interchanges that I tested the dry cornering and they do 95% as good as the max summer performance tires that I took off the car. Steering response and quietness is outstanding. Too soon to tell if my mileage will be better or worse than the Firestone Indy 500's that I took off. Will update further when I have 2K miles or more.